Nov 3 2018: Evening News (Kvöldfréttir), Bjarni Pétur Jónsson. RÚV. 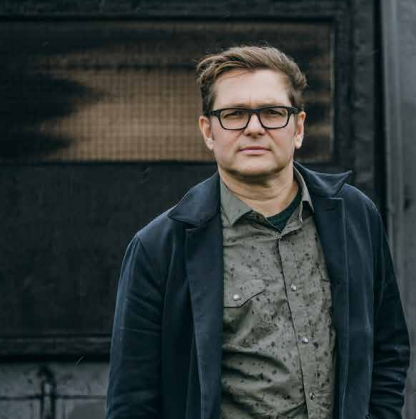 News coverage and interview with K. R. Thórisson on the Reykjavik A.I. Festival. Interview with Reykjavik A.I. Festival Keynote speaker Dr. Aljoscha Burchardt. Nov 2 2017: Society (Samfélagid), Leifur Hauksson. RÚV Rás 1. Interview with K. R. Thórisson about Reykjavik A.I. Festival. Oct 4 2017: The Mirror (Spegillinn), Valgeir Örn Ragnarsson. RÚV Rás 1. Interview with K. R. Thórisson about A.I. Apr 14 2017: The World of AI (Heimur gervigreindar). Guðmundur Pálsson & Vilhelm Anton Jónsson, RÚV Rás 2. Interview with K. R. Thórisson. Apr 13 2017: What is AI? (Hvað er gervigreind?). Guðmundur Pálsson & Vilhelm Anton Jónsson, RÚV Rás 2. Feb 15 2017: Community (Samfélagið). Leifur Hauksson, RÚV Rás 1. Interview with IIIM Director K. R. Thórisson about the January '17 Asilomar Beneificial A.I. Conference. Dec 1 2016: How Should We Treat Robots? (Hvað á ad gera með vélmennin?). Ásgeir Ingvarsson, Morgunbladid. Interview with K. R. Thórisson about realistic robots and the future of humanoids. Nov 11 2016: The Rise Of The Machines: Artificial Intelligence In Iceland. Paul Fontaine, Reykjavik Grapevine. Interview with K. R. Thórisson about the Icelandic Institute for Intelligent Machines (IIIM), Center for Analysis and Design of Intelligent Agents (CADIA), and related research on AI in Iceland. Nov 11, 2016: Evening News. Alma Ómarsdóttir, RÚV. 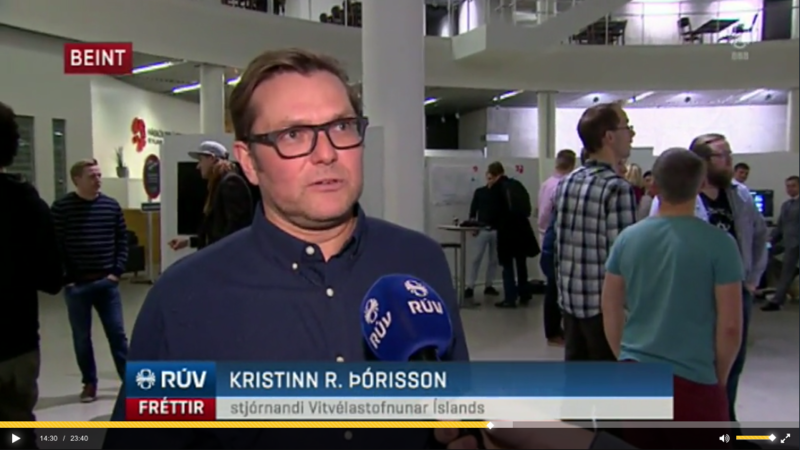 TV news interview with K. R. Thórisson regarding the future of automation. Nov 10 2016: Reykjavik Afternoon (Reykjavík síddegis). Kristofer Helgason, Bragi Gudmundsson, Bylgjan. Radio interview with K. R. Thórisson regarding the AI Festival at RU titled "AI & the Econonomy". Nov 10 2016: Introducing software that simulates the banking system (Kynna hugbúnad sem hermir eftir bankakerfinu). Erna A. Sigurgeirsdottir, Visir. Article about the AI Festival at RU titled "AI & the Economy". Oct 6 2016: Machines Without Will (Viljalausar vélar). Guðni Einarsson, Morgunbladid, p. 16. Newspaper interview with K. R. Thórisson about autonomous machines and the new US industry coalition for ethical AI. May 17 2016: Hail to the Computer. Daniel Oberhaus, Popluar Mechanics. Magazine interview with K. R. Thórisson about the future of AI. Newspaper interview with K. R. Thórisson about AI. Mar 16 2016: Evening News. Kjartan Hreinn Njálsson, RÚV Rás 2. TV interview with Kristinn R. Thórisson about the victory of AlphaGO over world Go champion Lee Se-Dol. Jan 6 2016: Ethics against the emergence of killer robots - Interview with Kristinn R. Thórisson. Jón Bragi Pálsson. NERRI.eu. Interview with Kristinn R. Thórisson on IIIM's new Ethics Policy. Nov 11, 2015: Vídssjá. Sindri Marteinsson, RÚV. Radio interview with Kristinn R. Thórisson about his RU AI lab (CADIA) and his work on strong AI for the past 7 years. October 201: Master & Servant. Mica Alen, Iceland Review, 5(53), 68-71. Interview with K. R. Thórisson about AI and IIIM's Ethics Policy for Peaceful R&D. Oct 22, 2015: Reykjavik Afternoon (Reykjavík síddegis). Kristofer Helgason, Thorgeir Astvaldsson, Bylgjan. Radio interview with K. R. Thórisson regarding IIIM & CADIA's AI Festival 2015. 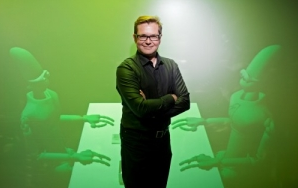 Oct 5, 2015: NOT SCARY: Meet the Icelandic Company Working on Artificial Intelligence. Paul Fontaine, Reykjavik Grapevine. Interview with K. R. Thórisson about AI and ethics. Article about the IIIM Ethics Policy for Peaceful R&D. Aug 16, 2015: Weekend Edition (Helgarútgáfan). Hallgrímur Thorsteinsson, RÚV Rás 2. Radio interview with K. R. Thórisson his research on self-programming AI, the potential for future AI to threaten humanity, and the scare tactics of AI fearmongers like Bill Gates, Elon Musk and Nick Bostrum. Aug 11, 2015: The Mirror (Spegillinn). Arnhildur Hálfdánardóttir, RÚV. Radio interview with K. R. Thórisson about the state of the art in A.I., his recent work on AGI, and the future and implications of increased automation in society. July 6, 2015: Vídssjá. Thórir Jónsson Hraundal, RÚV. Radio interview with IIIM/KRTh collaborator Thorbjorn Kristjansson about his recent grant to study the dangers of AI related to war and espionage. Feb 11, 2015: RÚV. Lísa Pálsdóttir. Radio interview with K. R. Thórisson about the Internet of things and home automation. Jan 21, 2015: Reykjavik Afternoon (Reykjavík síddegis). Kristofer Helgason, Thorgeir Astvaldsson, Bylgjan. Radio interview with K. R. Thórisson regarding Stephen Hawking's opinions about the future dangers of AI. Oct 11 2014: God From The Machine (Gudinn úr vélinni). 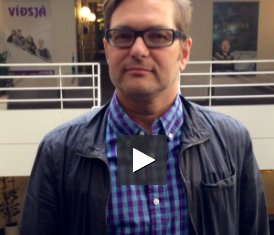 Kjartan Hreinn Njálsson, Frettabladid. Article about K. R. Thórisson's AI research at RU. Oct 2014: Sýndarvélmenni tekur sjónvarpsvidtal. Reykjavik University Magazine (Tímarit Háskólans í Reykjavík). Article about Outstanding Paper Award for the paper "Autonomous Acquisition of Natural Language" (Proceedings, IADIS Conference on Intelligent Systems & Agents, July), p. 14. Sep 14, 2014: Kristinn R. Thórisson on constructivist AI. Luke Muehlhauser, Machine Intelligence Research Institute, Berkeley, California. Online interview about Constructivist AI. Sep 2 2014: Tölvurnar byrjadar ad læra í HR (Machines have started to learn at RU). Hallur Mar Hallson, MBL.is. Video interview with K. R. Thórisson on S1 and the AERA system. Sep 2 2014: Í bítid (At dawn). Hulda Bjarna, Heimir Karlsson, Gunnlaugur Helgason, Bylgjan. 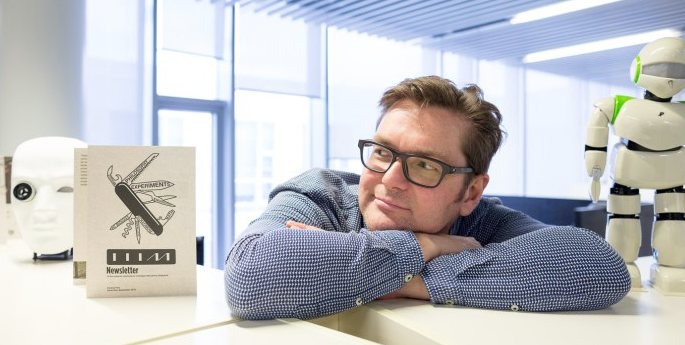 Radio interview with K. R. Thórisson on the IADIS Outstanding Paper Award and the future of AI. Sep 1 2014: Reykjavik Afternoon (Reykjavík síddegis). Bergsteinn Sigurdsson, Bjorg Magnusdottir, RÚV. Radio interview with K. R. Thórisson on the IADIS Outstanding Paper Award and the AERA system. July 24, 20:25: Innovation - Icelandic Science (Nýskopun - íslensk vísindi). Ari Trausti Gudmundsson & Valdimar Leifsson, RÚV. TV program interview with K. R. Thórisson about self-programming systems. July 21, 2014: Artificial Intelligence: The Next Step in Evolution? Peter Spinks, The Age. Online article quoting K. R. Thórisson. June 11, 2014: Active Mornings (Virkir morgnar). Gunnar Hannsson and Gudrún Gunnarsdóttir, RUV Rás 2. Radio interview with K. R. Thórisson about the Turing Test and the state of art in AI. Feb 19, 2014:Reykjavikk Afternoon (Reykjavík síddegis). Kristofer Helgason, Thorgeir Astvaldsson, Bylgjan. Radio interview with K. R. Thórisson about future of AI the potential associated dangers. Feb 17, 2014: Could Mean the End of Humanity if we Don't Play Our Cards Right ("Geti þýtt endalok mannkyns ef ekki er rétt haldið á spöðunum"). Jón Bjarki Magnússon, DV. Newspaper interview with K. R. Thórisson's advisee Thorbjorn Kristjansson about the potential future dangers of AI. Dec 16, 2013. Integrating Smart Robots Into Society. Horizon–the EU Research & Innovation Magazine. Magazine article quoting K. R. Thórisson about the HUMANOBS project. Dec 16, 2013. Integrating Smart Robots Into Society. Horizon – the EU Research & Innovation Magazine. Nov 13 2013, 11:28 - 11:38: Sjónmál, Hanna G. Sigurdadottir, Rás 1. Radio interview with K. R. Thórisson about AI research at RU and the future of robotics. Reykjavik University Magazine (Tímarit HR), 5(1):49. Article about K. R. Thórisson receiving the Kurzweil Award. Sep 13, 2013: Erla Hlynsdóttir, Fréttatíminn. Newspaper interview with K. R. Thórisson about receiving the Kurzweil Award. Aug 27, 2013: Reykjavík Siddegis. Kristofer Helgason and Thorgeir Astvaldsson, Bylgjan. Radio interview with K. R. Thórisson about future robots and the future of AI. Dec 18, 2012: Rokkland. International Research Award ("Alþjóðleg rannsóknarverðlaun"). RÚV Rás 1. Radio interview with H. P. Helgason about the Kurzweil Prize awarded to K. R. Thórisson, E. Nivel and H. P. Helgason for their AGI research. Dec 18, 2012: Computers Become Intelligent ("Tölvur fá greind"). RUV Rás 2. Dec 18, 2012: The Show Must Go On ("Getum ekki strax sest í helgan stein"). Fréttabladid, p. 16. Newspaper article about the Kurzweil Prize awarded to K. R. Thórisson, E. Nivel and H. P. Helgason for their AGI research. Dec 14, 2012: Awarded for Research in Artificial Intelligence ("Verðlaunadir fyrir rannsóknir á gervigreind"). MBL.is. Oct 13, 2012: Land of Fire, Ice, and Thinking Machines: The Recent Rise of AI in Iceland, and an Interview with the Thórisson Brothers who Helped Make it Happen. B. Goertzel, H+ Magazine. Online article. Aug 19, 2012: Endowing Computers With Human Intelligence ("Að gefa tölvum mannlega greind"). Morgunbladid, p. 32-32. Newspaper interview with K. R. Thórisson in relation to the AGI & Constructivist Summer School held in August 1 - 15, 2012 at Reykjavik University and the HUMANOBS FP7 research project. Aug 15, 2012: Q&A with experts on risks from AI #5. Alexander Kruel. Interview with K. R. Thórisson about the future of AI and associated dangers. Aug 19, 2011: Afternoon Radio (Reykjavík síddegis). Kristofer Helgason and Thorgeir Astvaldsson, Bylgjan. Radio interview with K. R. Thórisson about AI and the home of the future. Oct 15, 2010: 2+2=5. Marteinn Sindri Jónsson, RUV Rás 1. Radio interview with K. R. Thórisson about artificial intelligence. Oct 13, 2010: Morning Radio (Morgunútvarpid). Guðmundur Pálsson and Freyr Eyjólfsson, RUV Rás 2. Radio interview with Kristinn R. Thórisson about artificial intelligence and IIIM. Aug 30, 2010: Quantum Leap for Robobrains. Peter Spinks, The Age. Online article quotes Kristinn R. Thórisson on question of machine consciousness. Jun 13, 2010: Where Machines Have Intelligence (Þar sem vélar hafa vit). 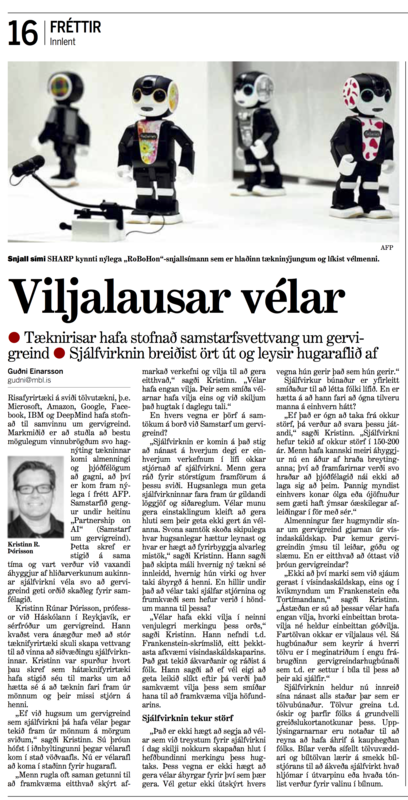 Newspaper interview with K. R. Thórisson about the Icelandic Institute for Intelligent Machines. Morgunbladid, pp. 20-21. May 7, 2010: 50 Years of Robotics (Part 2), Adam Klaptocz, Robotspodcast. May 31, 2010: Self-Assembly Consciousness. Peter Hankins on Conscious Entities. Apr 28, 2010. Reykjavik Afternoon (Reykjavik Siddegis). Kristófer Helgason og Thorgeir Ástvaldsson,, Bylgjan. Interview with K. R. Thórisson about robots, present and future. 17:10-17:20. Mar 2010: Artificial Intelligence and Intelligent Machines ("Gervigreind og vitvélar"). Interview with K. R. Thórisson, about the Icelandic Institute for Intelligent Machines. Verktækni, Issue 2, Vol. 16, pp. 8-9. Mar 12, 2010: IRobots: The Future of Artificial Intelligence. Adam Klaptocz, Robotspodcast. Online interview with K. R. Thórisson. Feb 24, 2010: Artificial Intelligence and Simulation at the Icelandic Institute for Intelligent Machines (Gervigreind og hermun í Vitvélastofnun Íslands). Interview with K. R. Thórisson regarding IIIM. Midjan.is, Iceland. Nov, 2009: Reynslusaga - að stofna rannsóknarsetur. Tölvumál #34, 16-17. Nov 31, 2009:Reykjavik Afternoon (Reykjavik Siddegis). Kristofer Helgason and Thorgeir Astvaldsson, Bylgjan. Interview with K. R. Thórisson about robots and AI. May 2009: Eintal vélarinnar. Tímarit Háskólans í Reykjavík, 10-11. Feb 11, 2009: Síðdegisútvarpið, RUV. Interview with K. R. Thórisson about the HUMANOBS grant. Mar 14, 2008: Stod 2. Gudmundur Palsson. Interview with K. R. Thórisson about Garage AI. Full page feature on CADIA. Rannís bladid (distributed with Morgunbladid). Oct 27, 2008: Singularity Summit Asks 'Are You A Believer?' Priya Ganapati, Wired. Mar 6, 2008: Twine is Lifeline for Semantic Tech. Carla Thompson, Guidewire/Wordpress. Feb 2008: CNET.com - Radar Networks raises $13M. Dan Farber, CNET News. Jan 2008: SciVest: 3 Questions for Nova Spivack. March 17, 2007: Sonus Futurae. Freyr Eyjólfsson, Stod 2. Interview with K. R. Thórisson about music and AI. March 5, 2007: Bílskúrsgervigreind. Unnur H. Jóhannsdóttir. Morgunbladid. Oct 19, 2007: Nova Spivack presents Twine. Web 2.0 Summit - The Semantic Edge. San Francisco, California. Oct 18, 2007: Twine: The First Mainstream Semantic Web App? Richard MacManus, Read/Write Web. 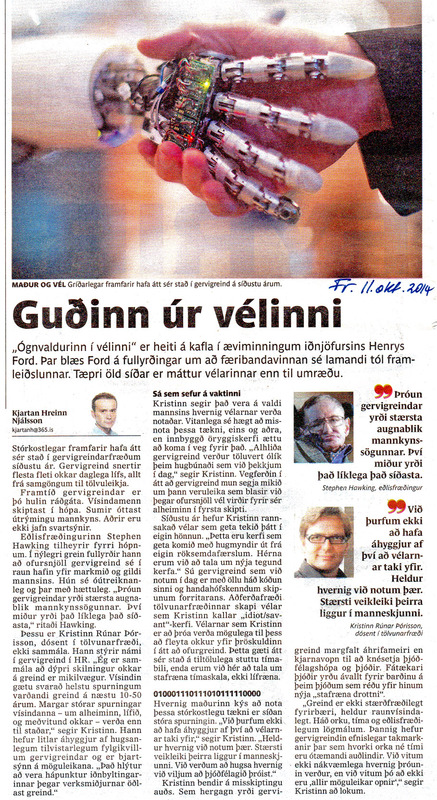 Sep 22, 2006: Feature, Gervigreindur útvarpsmaður. Morgunblaðið. Sep 22, 2006, 11:30: Samfélagið í nærmynd. Leifur Hauksson. RUV. Sep 22, 2006, 13:30: Ísland vítt og breitt. Ævar Kjartansson. RUV. Sep 22, 2006, 17:55: Síðdegisútvarp Bylgjunnar. Þorgeir Ástvaldsson, Bylgjan. Sep 22, 2006, 19:15: Evening News. Sölvi Tryggvason, NFS/Stod 2. Sep 22, 2006, 17:03: Víðsjá. Guðni Tómasson. RÚV. Interview with G. R. Jonsdottir & F. Magnusson about Robot Opera and Skundar the Robot. RUV, Rás 1. Spring 2006: Ísland í bítid. Interview, Stöð 2. Spring 2006: Samfélagid í nærmynd. Sigurlaug Margrét Jónasdóttir, RÚV. Spring 2006: Síddegisútvarp Bylgjunnar. Þorgeir Ástvaldsson, Bylgjan. Spring 2006: Vídsjá. Guðni Tómasson, RUV, Rás 1. Spring 2006: Evening news. RUV. Spring 2006: Kastljós. Ragnhildur Steinunn Jónsdóttir, RUV, Rás 1. Spring 2006: Newshour. Hallgrímur Thorsteinsson, NFS. Spring 2006: Newshour. Kristján Hrafn Guðmundsson, NFS. Dec 2006: The New Revolutionaries. The Guardian. Nov 2006: Entrepreneurs See a Web Guided by Common Sense. Okt 28 2005: Feature, Af kjotvélum og vélmennum. Lesbók Morgunbladsins. Full page interview, back page. Summer 2005: Feature, Daði Rúnar Jónsson, Vidskiptabladid. Spring 2005: Hallgrímur Thorsteinsson, FM 99,4. Interview about Garage AI. Spring 2005: Feature, Vélmenni og gervigreind. Rannís Newsletter. Spring 2005: Feature, Hrósið. Fréttabladid. Summer 2004: Vídsjá. Guðni Tómasson, RÚV, Rás 1, Reykjavík. Oct 2002: Scientific American Frontiers, The Intimate Machine. Feat. K. R. Thórisson’s research. July 2000: Red Herring. Feature, Cracking the Code of Desire. June 1998: Danish National Television Prime-time News. Feat. LEGO Wizard Group’s research, incl. K. R. Thórisson’s work. Dec 1997: Icelandic National Television Prime-time News. Dec 1997: The Boston Phoenix. You, Robot. July 1997: New World - Siemens Magazine. Cyberspace–the Final Frontier. Feb 1997: BBC – Soundbytes. Feature, K. R. Thórisson’s research. Nov 1996: MIT Research Digest. Oct 1996: Inventing the Future. June 1996: The Daily Spectrum. Article about K. R. Thórisson’s lecture at the First Conference on Virtual Humans.